S Ganesan, C Jeer. Bilateral Quadriceps Tendon Rupture. Not Always Traumatic? : A Case Report. The Internet Journal of Orthopedic Surgery. 2005 Volume 3 Number 1. Simultaneous bilateral quadriceps tendon rupture is an uncommon injury, barely reported in the literature. Reportedly up to 50% of spontaneous quadriceps ruptures are misdiagnosed at first, resulting in poor outcome. We report a case of spontaneous bilateral quadriceps rupture and review the literature and briefly discuss about the various associations and the management strategy. 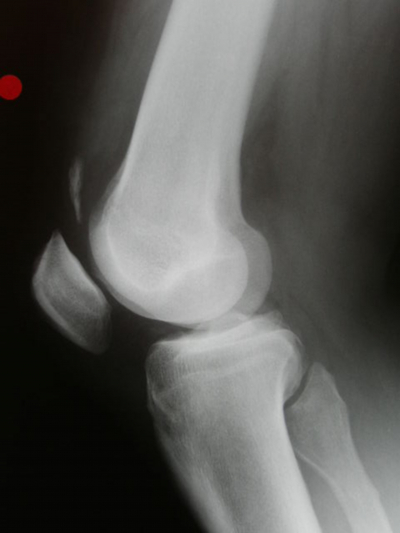 Unilateral quadriceps tendon rupture is a common injury and has been well reported 15.However bilateral ruptures of the quadriceps tendon occur infrequently and usually occurs in patients older than 40 years, and is either due to fall from the stairs or spontaneously while walking 17.Spontaneous bilateral ruptures are highly correlated with systemic diseases 11, but also have been reported in healthy individuals without predisposing factors. 65 years old man presented with painful knee and inability to weight bear on both sides after he stumbled down the stairs. He was morbidly obese (BMI-40) with no significant past medical history. Examination revealed swelling and ecchymoses around both the knees, with palpable gap in the suprapatellar region and inability to straight leg rise on both the sides. 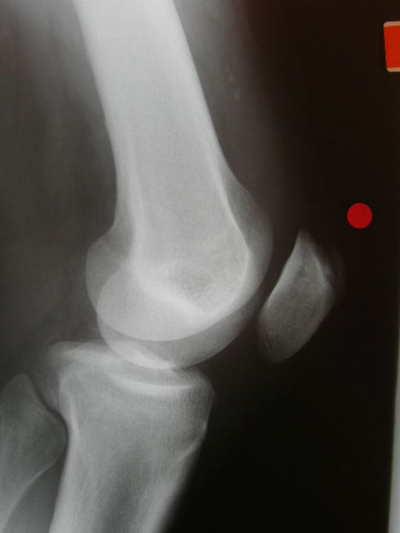 X - ray revealed loss of continuity of soft tissue shadow of the suprapatellar tendon and flake of calcification within the substance of the quadriceps tendon. (Figure 1&2). 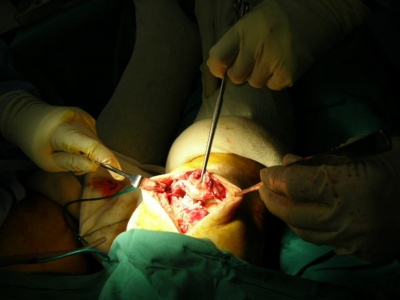 A clinical diagnosis of bilateral quadriceps tendon rupture was made and the patient was taken for surgery. Both the tendons were found to be disrupted at the tendo osseous junction (Figure 3) and were repaired with PDS sutures with drill holes placed in the patella .And the limbs were immobilized in cylinder cast for six weeks. Simultaneous bilateral quadriceps tendon rupture is an uncommon injury that is frequently misdiagnosed. There have been reports of cases being initially treated as ministroke 16 .The triad 12of history of fall, inability to actively extend the knee and palpable supra patellar gap is highly suggestive of quadriceps tendon rupture. The reviewed literature recommends early repair and therefore early diagnosis is crucial. Quadriceps tendon rupture usually occurs with rapid contraction of the quadriceps muscle with the foot fixed in the ground and knee partially flexed. This usually occurs with fall down the stairs or spontaneously while walking. McMaster 11showed that normal tendons in rabbit do not rupture under stress.Harkness demonstrated that approximately 30kg/mm2 of longitudinal stress may be applied to normal quadriceps tendon prior to failure. But most of the ruptures occur after relatively minor trauma.Therfore tendon rupture necessarily has to occur through the pathologic area of the tendon. Many conditions have been reported to contribute to degeneration of the quadriceps tendon. Risk factors of the quadriceps rupture include hyperparathyroidism 7,13, 14,chronic renal failure ,4,6,9,18,19,gout 19,obesity, leukaemia, rheumatoid arthritis, Diabetes mellitus1, systemic lupus erythematus, infection, metabolic diseases, steroid abuse 3,28tumours, immobilization. The underlying patho- physiology that leads to rupture varies with the disease process. Most of the cases reported are associated with chronic renal failure. The patho- physiology behind this is poorly understood. Various theories have been put forward. It is thought that chronic academia leads to degeneration of tendon4 .It is also believed that uraemia affects the structure of the protein polysaccharide complex2. And it may be also due to secondary hyperparathyroidism. 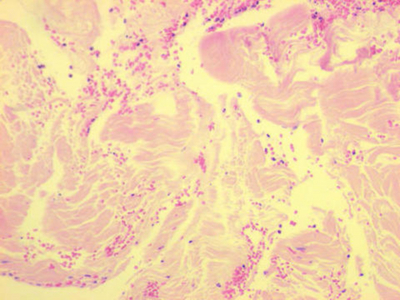 It is also associated with patients on long-term dialysis probably due to amyloidosis. 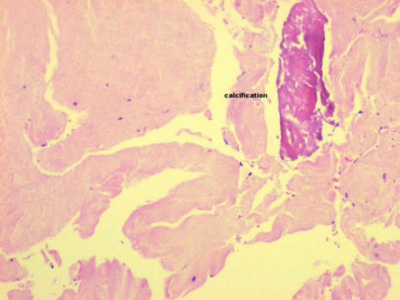 Diabetes mellitus can cause arteriosclerotic changes in tendon vessel, fibrinoid necrosis of tendon is seen in chronic synovitis.Hyperparathyroidism cause dystrophic calcification and subperiosteal new bone formation at the tendon insertion. Obesity causes fatty degeneration of tendons. Steroids alter the structure of collagen. So patient with this injury should be evaluated for underlying medical condition especially renal or endocrine cause.